Can't decide if you want chocolate cookies or a brownie? 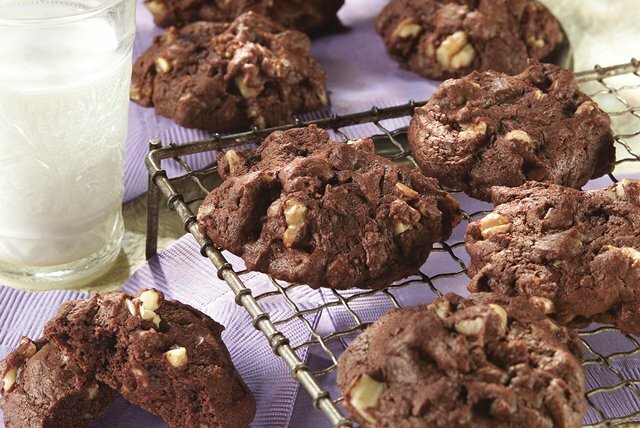 Our tasty Chocolate Brownie Cookies recipe has your name all over it—so let's get started! Preheat oven to 325°F. Microwave chocolates and butter in large microwaveable bowl on HIGH 2 min. or until butter is melted. Stir until chocolate is completely melted. Add sugar; mix well. Blend in eggs and vanilla. Add flour, baking powder and salt; mix until well blended. Stir in pecans. Bake 12 min. or until cookies feel set to the touch. Cool 1 min. ; remove from baking sheet. to wire racks. Cool completely. Store in tightly covered container at room temperature for up to 1 week. If omitting nuts, increase flour to 1-1/4 cups to prevent dough from spreading out too much as the cookies bake. Makes about 3 doz. or 36 servings, one cookie each. Substitute 1-1/2 pkg. (4 oz. each) BAKER'S Bittersweet Baking Chocolate for the semi-sweet chocolate.